Unwrapped mini cups.Deliciousness meets convenience. 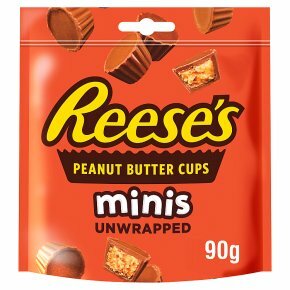 The REESE'S Mini Peanut Butter Cups Bag is the ultimate combination of flavour and ease. No wrappers to undo; just open the bag and pop one of these perfectly shaped mini REESE'S Peanut Butter Cups into your mouth. It's got all the rich taste of a full-size REESE'S Peanut Butter Cup. The perfect combination of chocolate and peanut butter that will keep you reaching for more!